Hass-like but with larger fruit, bears 4-6 weeks earlier than Hass (Feb-Oct in California). More cold hardy than Hass. I have a small tree so it would take a while to know how it grows in South Florida. There is not a lot of info out there for this variety. 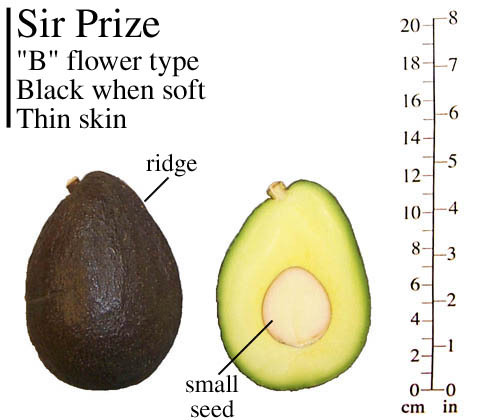 Read the information on the Proceedings of The World Avocado Congress III, 1995 114 - 118 about Sir Prize. I do not sell trees, bud wood or fruit. I have this tree for experimental purposes and personal consumption if in fact they are consumable, to be determined. Update December 20, 2012: I top worked a tree. I could take 2-3 years before evaluation. January 19, 2013: All 10 grafts took on this tree so we are well on our way. I will have to thin out to 4-6. January 28, 2013: We ate a California home grown Sir Prize avocado today. Incredible taste. This is quality. A lot better than store bought Hass from Chile or Mexico. I sure hope this tree grows here well. I did not take any picture but the fruit looks like the picture in this page but the seed seems a bit larger. 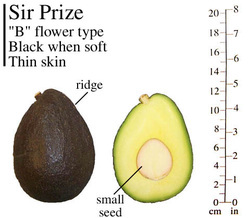 March 30, 2013: The Sir Prize avocado is on its way to get established in Homestead. The tree is doing very well, It should explode as temperatures warm up. Seems to love it here. Is the biggest of all the trees top worked in December.May be next year we can see fruit. July 5, 2013: The tree is doing great. is the largest of the 4 trees grafted on that day. See picture. October 30, 2013: The tree is building flower buds, could be flowering soon. December 4, 2013: The flower bud building process of this tree is very slow, here we are 35 days past the last entry and no open flower. Probably another couple of weeks. December 16, 2013: Still no open flowers. Very unusual. December 31, 2013: I was really hoping to see open flowers in the Sir Prize.I don't recall seeing a tree with flower buds about the same size for so many weeks. I took pictures today to keep a record. The tree is dropping some leaves as part of a natural process but most of my other trees to that about the middle of the flowering process. I wonder if its waiting for a cold spell? January 21, 2014: This tree really surprised me I was expecting it to have open flowers by now. It is exactly the same, no indication of bud brake. February 12, 2014: Incredible, this tree still is in a 512 stage like it was in December, very unusual. February 27, 2014: Finally the inflorescence are beginning to expand. This is a very unusual tree, 3 months + building flower buds. We may have open flowers in a week or so, but with this tree is hard to predict anything. March 11, 2014: The inflorescence continues to expand very slowly. No open flowers yet. Very unusual this tree, 4 1/2 months in the flowering process. I wonder if this is how they are or there is something wrong with this tree. March 15, 2014: I'm beginning to see very few open flowers. April 5, 2014: This tree continues to surprise. Alter all the delay in flowering and the flowering 75% done I do not see any fruit set. A lot of trees do this the first year of top work only to come very strong on the second season. Hope is the case. April 28, 2014. Confirmed, no fruit set. Looking towards the next season. December 12, 2014. The tree is doing the same thing as last year. It is building flower buds as if it was going to flower in a couple of weeks or less. January 11, 2015: Exactly the same as last year. The flower buds are there moving very slowly. In any other tree from the stage they are in should have opened by now. February 26, 2015: This tree is flowering earlier than last year. There are few open flowers, more coming soon. Let's see if the tree sets any fruit. Seems to be a small tree, I see similarities with the Holiday tree. Does not seem like it is a strong tree. The tree seems to defoliate more than my other trees at this time of the year. April 17, 2015: Seems like the tree did not set any fruit again this year. One more year of evaluation is warranted but appears the tree does not like it here. October 18, 2015: I was around the Sir Prize tree and found a pleasant surprise: a 24-26 oz fruit on the tree, a few inches from the ground. Rare that it survived herbicide applications.I had the tree under the Hass like section but after seen this fruit this tree has nothing to do with Hass. Large beautiful fruit. Did not touch it because I wanted to find out about possible picking dates but looked done. November 3, 2015. That beauty tuned into something nasty. All sorts of post harvest disease or God know what! I suppose we could give it the benefit of the doubt because it was so low to the ground. Big disappointment. See picture.